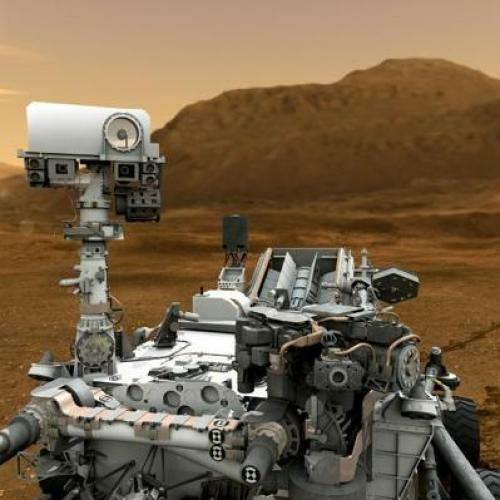 Early Monday morning, NASA’s half-ton, nuclear powered Curiosity rover touched down on the surface of Mars. Minutes later, the rover tweeted, “GALE CRATER I AM IN YOU!! !” The Robot’s outburst prompted a retort from Stephen Colbert. “I don’t know who this Gale is, but gentlemen don’t kiss and tell,” he admonished on his Tuesday show. But Colbert had his facts wrong—Curiosity is no gentleman. McGregor leads a team of three women who run Twitter feeds for a variety of NASA rovers, landers, and probes, all in the first-person. Before NASA, she worked as a producer at CNN for fifteen years, where she covered space exploration and other topics. She has been at the forefront of NASA’s social media presence since 2006, when the space agency first entered the interactive online arena. Stephanie Smith, a former print and online journalist, brings humor to the team. “My interests include theater and improv comedy,” she told me. “For all three of us, I feel like our disparate interests are converging on this job in a weird, wild, wonderful way.” Courtney O’Connor, a former Microsoft intern who rounds out the trio, joined recently as her first job out of college. Much has changed since the grainy images and grim gravitas of the Apollo days. “It once was one small step... now its six big wheels,” Curiosity mused, a few moments after the Gale Crater tweet. “I don’t think you get to be big on Twitter if you don’t have a sense of humor,” said McGregor. “It doesn’t mean that we’re compromising accuracy for entertainment value.” Indeed, as long as Curiosity, and the people who give voice to her, are on the NASA payroll, silliness will be plentiful, but it won’t come at the expense of science.